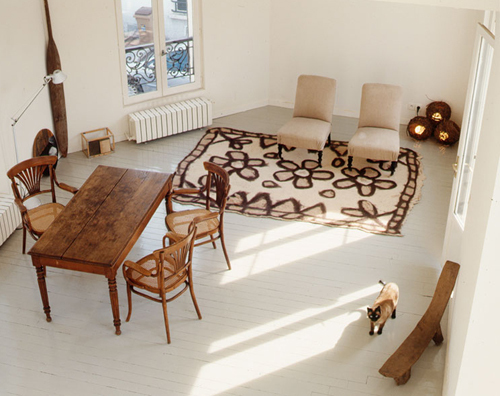 This is the Paris home of well known trend watcher Li Edelkoort. This beautiful house is decorated with only a few elements in mind: the color white, natural materials such as wood and ethnic furniture and accessories. Li’s kitchen (image above) is a mix of old and new. Stainless steel is combined with old timber. 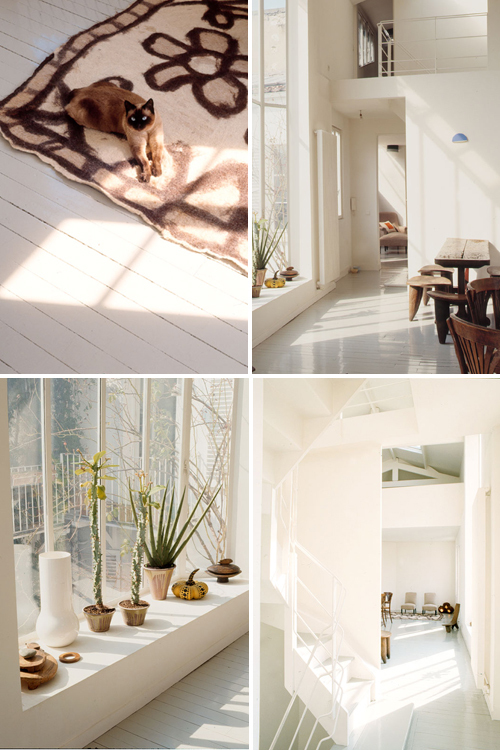 The house is spacious and airy with beautiful natural light coming through the many windows. “Simplicity has been the key,” says Edelkoort. Her simplicity is synonymous with refinement and elegance. The three-storey apartment has a living area with high ceilings and an open plan kitchen area. The bedroom is separated from the rest of the house. The decoration is sober and simple with only a few furniture pieces. 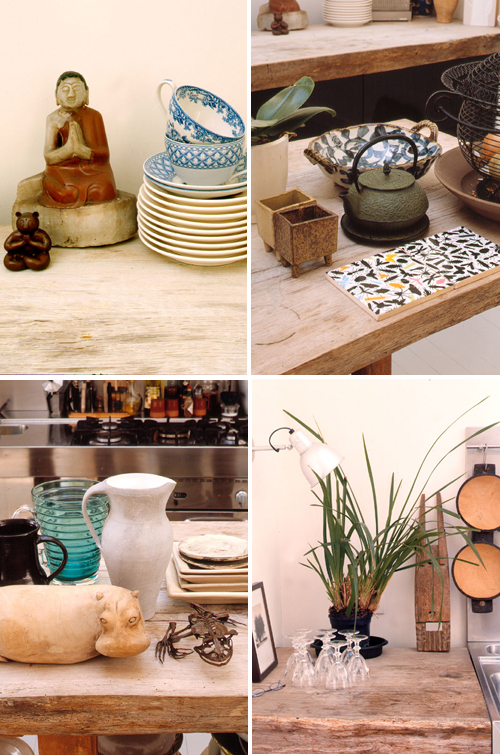 The only concessions to the decor are artifacts collected from all over the world. What a beautiful natural light! THe hippo decor seems cute! I love your blog, especially for posts like this. Very inspiring! I run a Swedish interior design blog and since english is not my first language I rarely comment, but I just wanted to let you know I love style-files! This is so funny. Last weekend I discoverd Ilse Crawfords book “home is where the heart is” again. In this book you can see photo from Li Edelkoort kitchen and the cat, sitting on the table. I’m absolutly fascinated by this picture, since I saw it the first. Nice to see more of her place. i love her taste. i was lucky enough to go to her apt and its even lovelier in person. though i do remember her having a larger more fantastic table in the dining area. the scale of the furniture in the space is really great. Your point of view for home designing is fantastic !! These shots are very inspiring – all that white, beautiful. I agree with Nicole, i just had a look again at the book from Ilse Crawford, but in that book you see a painting in the kitchen with “Boy I am scared!” on it. That painting is so funny! Very stylish… and boring. I am a little disapointed – empty and colorless. 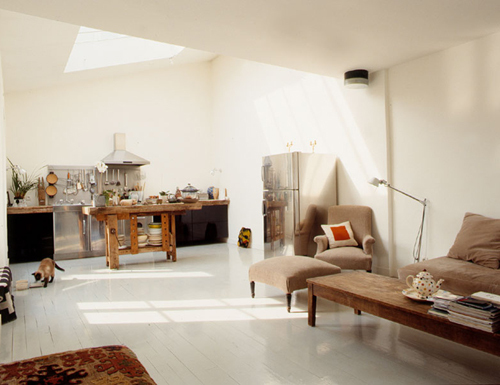 how refreshing to see plain white walls…and such light! Pingback: ??????????????????? - SocialMediaLabo - ?????????? ?